sculpture "Pieta") wearing a traditional native death mask for dancing.
" 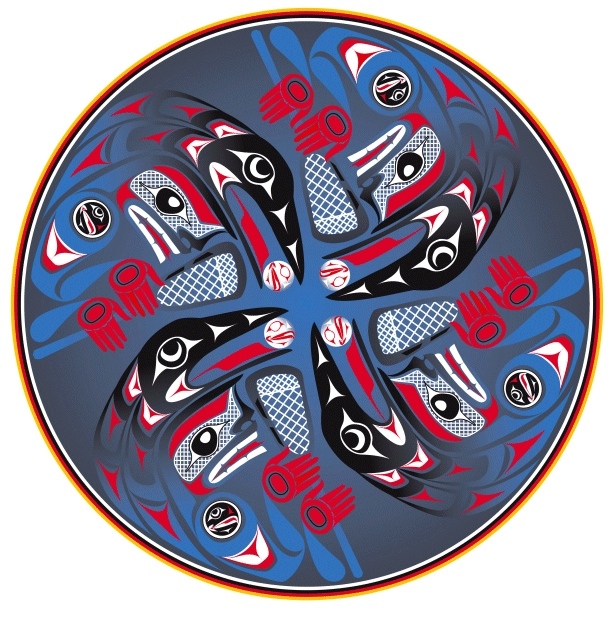 RAVEN RELEASING THE SUN "
According to a Haida story, in the beginning the world was in total darkness. The Raven, who had existed from the beginning of time, was tired of groping about and bumping into things in the dark.Eventually the Raven came upon the home of an old man who lived alone with his daughter. Through his slyness, the Raven learned that the old man had a great treasure. This was all the light in the universe, contained in a tiny box concealed within many boxes. At once the Raven vowed to steal the light.He thought and thought, and finally came up with a plan. He waited until the old man's daughter came to the river to gather water. Then the Raven changed himself into a single hemlock needle and dropped himself into the river, just as the girl was dipping her water-basket into the river.As she drank from the basket, she swallowed the needle. It slipped and slithered down into her warm belly, where the Raven transformed himself again, this time into a tiny human. After sleeping and growing there for a very long time, at last the Raven emerged into the world once more, this time as a human infant.Even though he had a rather strange appearance, the Raven's grandfather loved him. But the old man threatened dire punishment if he ever touched the precious treasure box. Nonetheless the Ravenchild begged and begged to be allowed to hold the light just for a moment.In time the old man yielded, and lifted from the box a warm and glowing sphere, which he threw to his grandson.As the light was moving toward him, the human child transformed into a gigantic black shadowy bird-form, wings spread ready for flight, and beak open in anticipation. As the beautiful ball of light reached him, the Raven captured it in his beak!Moving his powerful wings, he burst through the smoke-hole in the roof of the house, and escaped into the darkness with his stolen treasure. 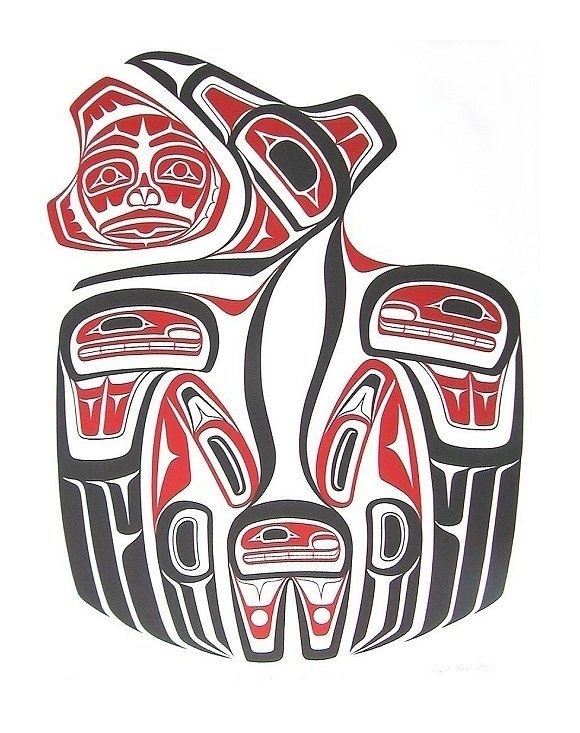 Eagle is respected for its intelligence and power, as well as its extraordinary vision, in both the literal and figurative senses.Eagle clan families are traditionally the most prominent, and Eagle chiefs the most powerful. Eagles in myth are, likewise, usually noble characters. 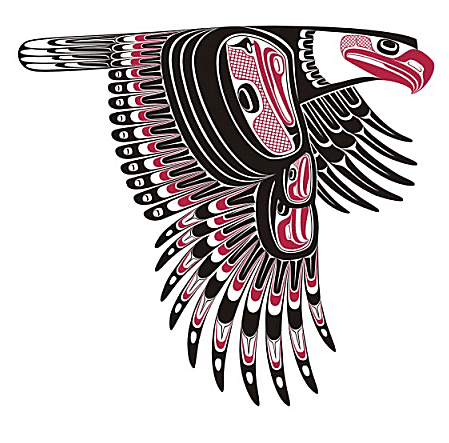 Eagle spirits are associated with lofty ideals and the pursuit of freedom.Eagle is revered as a powerful hunter. 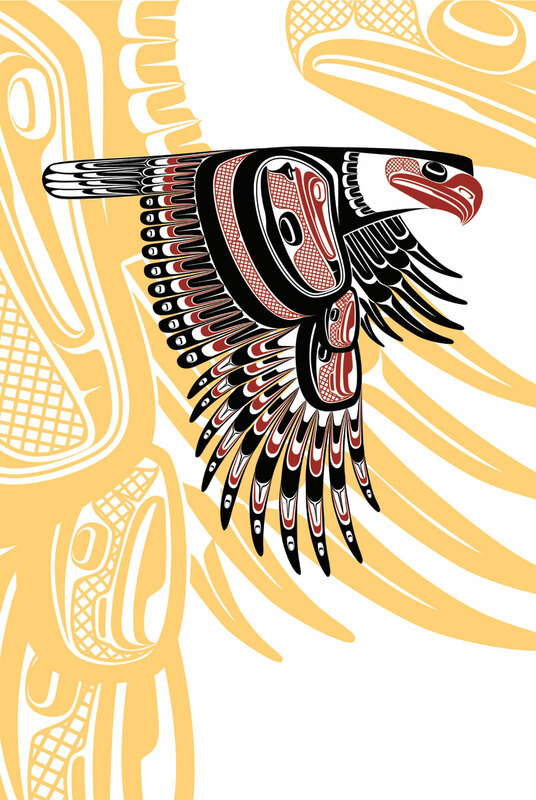 Groups of mythical Eagles may gather for co-operative whale hunting expeditions, since, unlike the giant Thunderbird, Eagle is not strong enough to hunt whales alone. 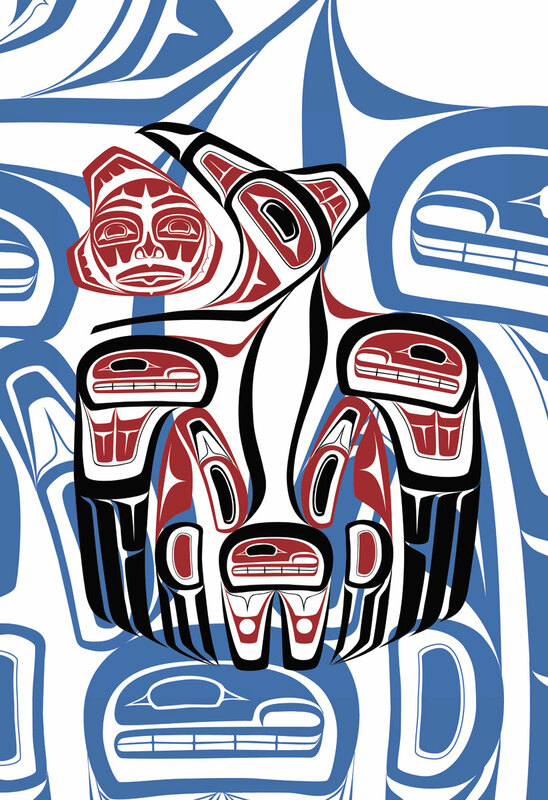 Eagle may often be depicted with Salmon, one of its favorite foods. 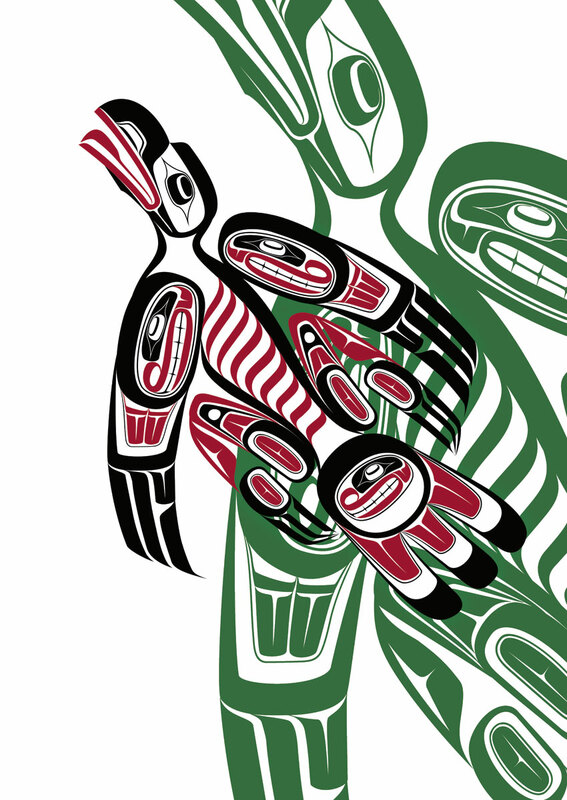 Eagle feathers and down are sacred: traditionally, shamans believed in their healing powers and used them in a variety of ceremonial and ritual contexts, such as honoring a respected guest.In some Haida myths and legends, Eagle and Raven are close companions and serve as alter egos to one another They are two halves of the great whole, often divided and often united. They are technically equals.In this design of the Eagle his beautiful, high-ranking legendary wife and the two children Eagle bore with her are incorporated in his wings.
" SPEAKERS STAFF 1 "
" SPEAKERS STAFF 2 "
it is the turn of whoever is holding the talking stick to speak. 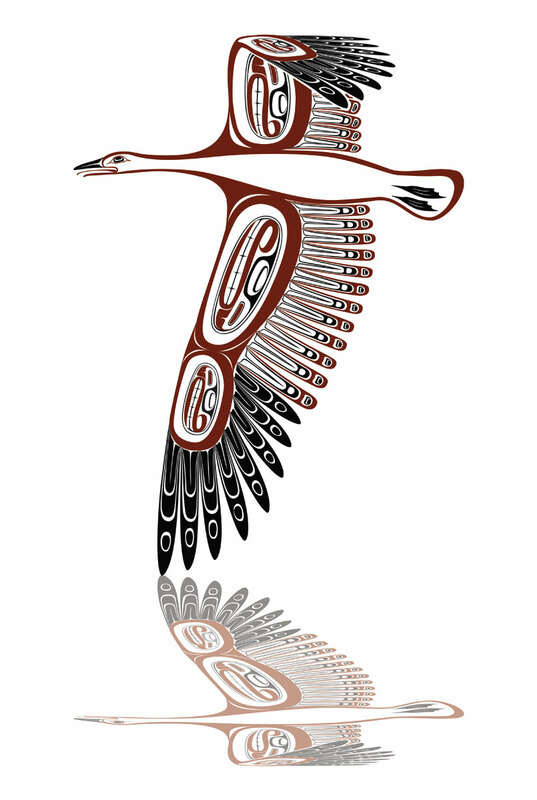 In this graphic representation of a talking stick there is as follows, Wearing a tall hat of wealth with its potlatch rings, is a long billed Raven. Snag is often equipped with fingers or hands, as a sign of transition between human and avian forms. 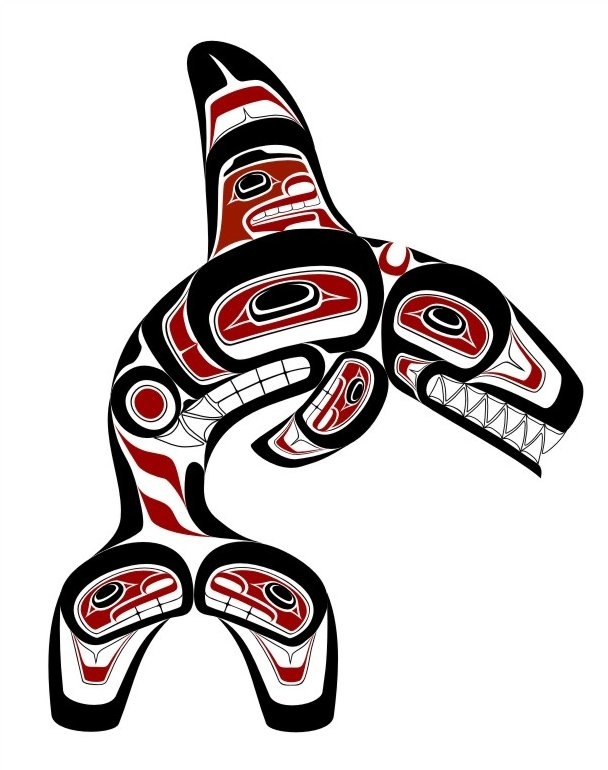 which stood on the floor of the ocean before the creation of the Haida Gwaii. 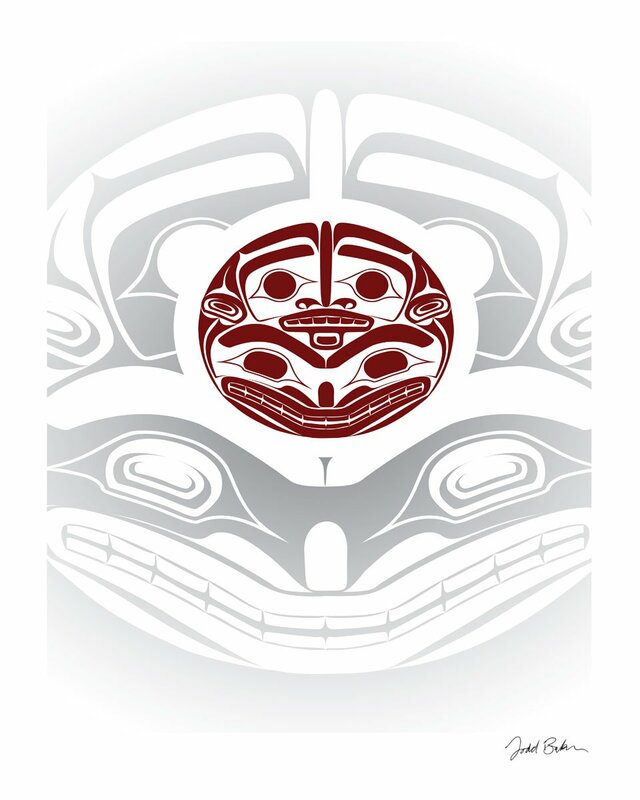 In this graphic representation of a speakers staff, is the creation of the world told by the haida gwaii elders.
" SPEAKERS STAFF 3 "
Memorial Award" to the Minto Cup (National Junior 'A' Championship) athlete who best exemplifies leadership, skill, sportsmanship, and the spirit of the game. and many institutions. 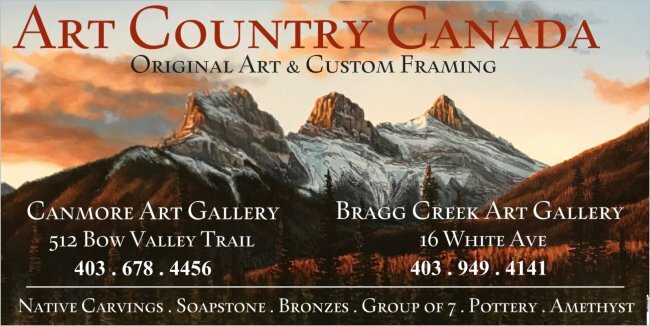 His work has been shown throughout the World. with colored rings represents the circle of life. the lives of thousands of young Canadian athletes in a positive manner. the game we love so much. 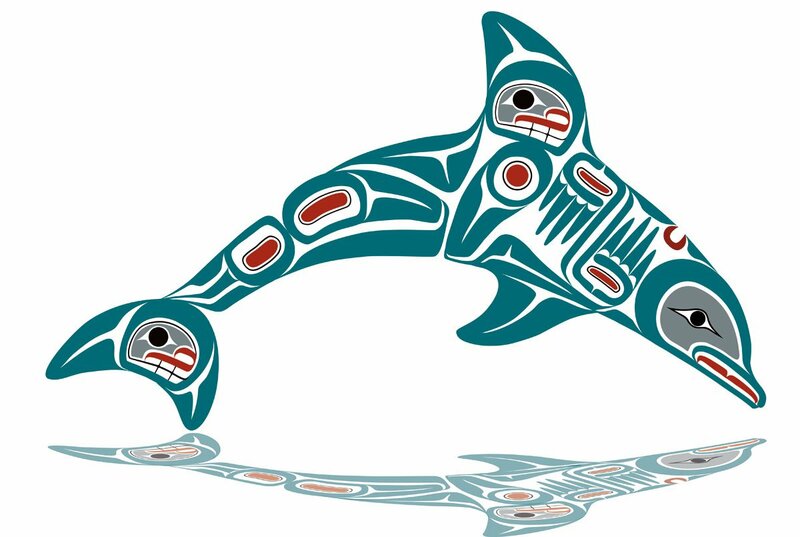 The legend of the Killer Whale is a tale of Natcitlaneh who was abandoned on an island by his brothers-in-law who were jealous of his prowess as a hunter. 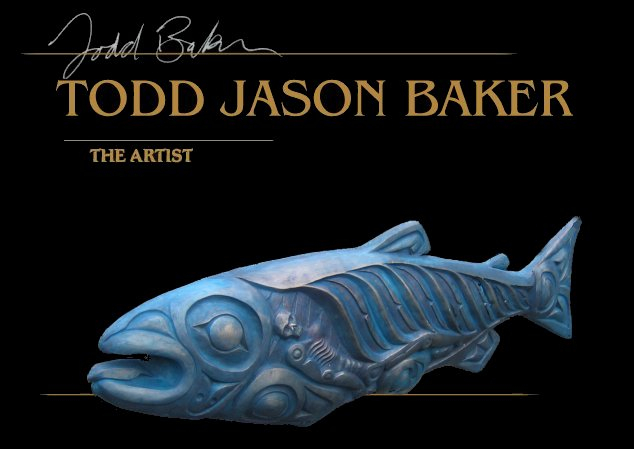 enabled him to carve eight wooden Killer Whales. These Whales came to life when they were placed in the sea and avenged him by killing his brothers-in-law. it underwater to transform the occupants into Whales. Thus a Whale near the shore was a human transformed and trying to communicate with his family. The Whale is a popular symbol for romance as they mate for life. 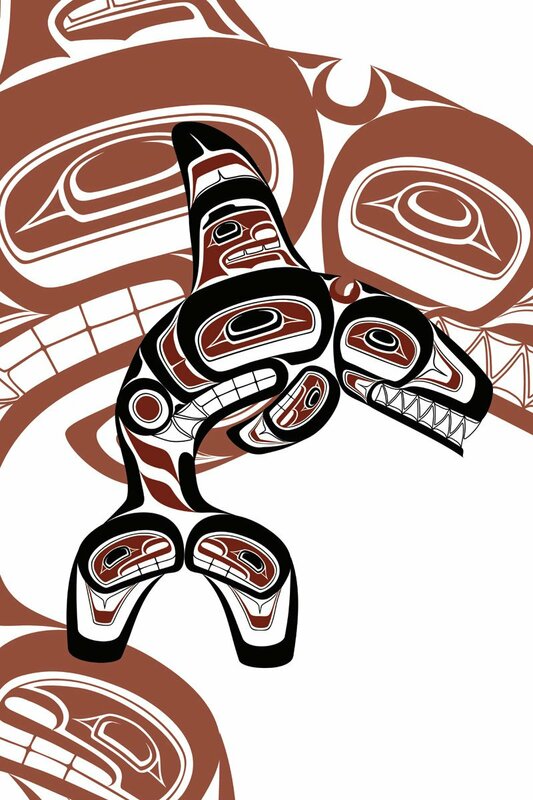 The Whale, like the Wolf, stays with its family and travel in large pods.